Strange noises from the boiler? Is your heating showing signs of old age? Do the radiators require frequent bleeding? Are the radiator valves leaking & difficult to operate? Are some radiators cold at the bottom or in the middle? 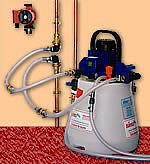 The power flushing process is a versatile, easy to use and highly effective method of flushing heating systems. By utilising the flushing pump, it enables heating systems to be purged of sludge, scale and corrosion deposits with minimal dismantling and disruption. System flushing will not remedy design or mechanical faults, which should be rectified, but in many cases it will cure the problems caused by these. Power flushing prices start from £375.00. It is advisable to employ a trained engineer to carry out your power flush because an untrained person can easily ruin your central heating system by, for instance, using an incorrect solution to clean a boiler containing an alumnium heat exchanger. Click here to see if your boiler has an aluminium heat exchanger. If it has, make sure FX2 isn't used to clean the system! 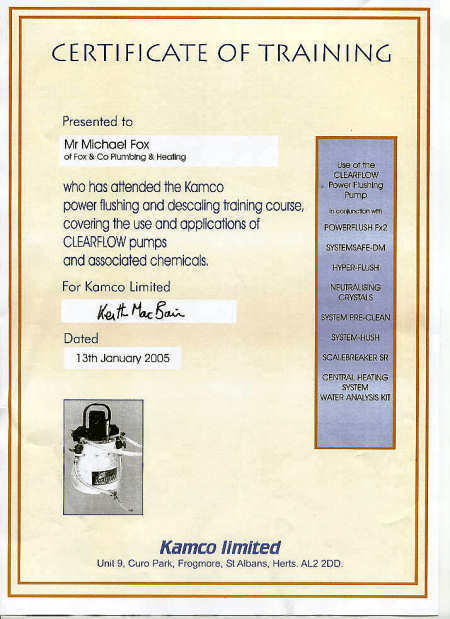 Fox & Co tradesmen have attended the Kamco training courses in power flushing and use only the latest, most up to date Kamco equipment when performing a power flush. We also analyse the water on completion using a TDS meter to compare the contents of your system with the water from your kitchen tap!